One of the newest additions to our selection of locally made merchandise items here at the museum is, well, simply divine. We now sell an assortment of delicious cookies made by the Sisters of St. Benedict! The sisters bake their tasty treats at the Simply Divine Bakery on the grounds of the Monastery Immaculate Conception in Ferdinand, Indiana. In 1852, the first Benedictine women arrived in the United States from St. Walburga Abbey in Eichstätt, Germany. The Benedictine Sisters settled in Pennsylvania and Kentucky before making their way to Indiana. In 1867, four sisters arrived in the German-Catholic settlement of Ferdinand, Indiana, where teachers were needed who could speak fluent German. By 1886, there were 72 sisters living in the Ferdinand community. A larger monastery was constructed, which still overlooks the town of Ferdinand today. 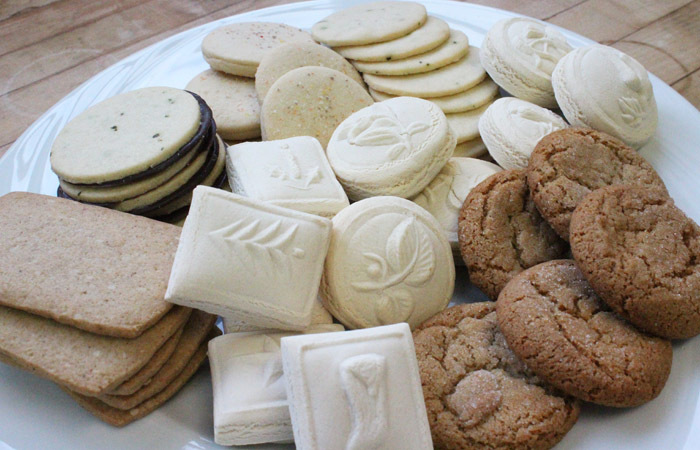 Craving gingersnaps or shortbread? How about a taste of those classic German biscuits, Springerles? The assortment box contains several varieties and may be the answer to your prayers! Stop by and pick up a box the next time you visit the Santa Claus Museum. And for more information on the Simply Divine Bakery and Sisters of St. Benedict, visit http://www.thedome.org/.